At Plast 2015, which takes place from 5 until 9 May 2015 in Milan, Macam S.r.l. will present the innovative technological module activeFlowBalance in operation on a high-precision, all-electric injection moulding machine. At stand D162, hall 24, German-Japanese machine manufacturer Sumitomo (SHI) Demag’s Italian representationwill demonstrate an exhibit with a particularly high added value according to the “Blue Technolution” concept. At this year’sPlasttrade show, Macam S.r.l.will exhibit its “Blue Technolution” products, which are impressing customers with their high production and energy efficiency. An all-electric IntElect 100 (clamping force 1,000 kN) is producing wall plugsusing a 32-cavity mould. This production project is particularly challenging because it requires an even filling of 32 capacities without creating burrs. This is a perfect area for the activeFlowBalancetechnology module. The stand technicians will demonstrate how an active or inactive activeFlowBalancemodule affects the quality of the moulded parts in the individual cavities.The parts are removed by a linear robot from Yushin Precision Equipments Co. Ltd.The SAS Automation gripper system places the dowel on a conveyor belt. The quality of the moulded parts is monitored by an Ushio Lighting Co., Ltd. camera system.This way, potentially defective parts can be separated quickly and disposed of as waste. During challenging applications with minimum tolerances, reliability, constant processes and precision are demands that are perfectly met by the IntElect all-electric machine range. The IntElect range is equipped with Sumitomo (SHI) Demag’s direct electric drives, which were developed and manufactured by the company, and optimized for injection moulding. In contrast to belt electric drives, these direct drives achieve a higher energy efficiency and their highly dynamic movement axes ensure maximum precision, better repeatability and significantly lower cycle times. 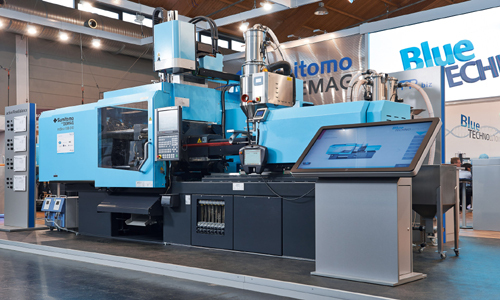 Equipped in this way, all-electric machines from Sumitomo (SHI) Demagmeet the specific challenges of the large-scale production of injection moulded precision parts. IntElectmachines are part of the Sumitomo (SHI) Demag’s “Blue Technolution” range of products.“Blue Technolution”is the label attached to Sumitomo (SHI) Demag’sSystec SP, El-Exis SP, IntElectand Systec Servo machine ranges and describes a technologythat is able to gradually reduce the current fleet consumption by 30% until 2016. The activeFlowBalancemodule is able to correct the uneven and unreliable balancing of multi-cavity moulds and prevent related detrimental effects such as burrs, underfilling and mould damage. The activeFlowBalance feature uses the expansion of the compressed plasticized material during the changeover between injection and holding pressure, which leads to a more extensive filling of partially filled cavities due to their lower counterpressure. The filling levels balance themselves out naturally without extending cycle times.